As we spring into the month of March, new and promising artists are blooming in our community! This week, our opening reception for our emerging artists show, New Seen: LOOK, will feature 15 art students from Orange High School. These young artists will be given the opportunity to experience a professional gallery exhibit, from mounting their works, to pricing art, and hopefully even selling their pieces! The show will be professionally hung and promoted throughout the surrounding community. These talented students will share their individual perspectives with friends and newcomers alike. We hope that you will be able to join us in both supporting and celebrating these young, rising artists! The exhibit will be on display from March 8th through April 6th, with an opening reception on March 8th, from 5:00pm to 7:00pm at Valley Arts. We hope to see you there! 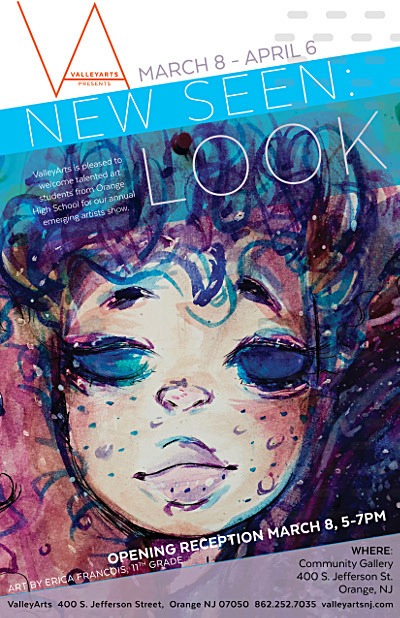 New Seen looks to highlight the works of local emerging artists, annually in the Community Gallery located at Valley Arts, 400 S. Jefferson Street, Orange, NJ.